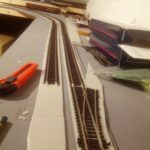 So since the laying of the track had actually started I thought I ought to do a brief post around what I’m doing to lay the track as there seem to be different ways that people achieve it. In terms of the actual track I’m using Peco Code 100 streamline track. That means all the curves will be laid freehand, so I’m going to have to make sure I get them smooth. The turnouts (or points) are also the Peco streamline ones, and I’m using the electro frog version so that the frogs will switch with the points. This will make the wiring slightly more fun, but seems to be the modern way of thinking and suggested for DCC running which I hope to get to soon. I did quite a lot of reading around when it came to laying the track and realised that there are a whole range of options out there for underlays and fixing methods. The general recommendation seems to be to use some form of underlay to reduce the noise and to avoid track pins if possible as these transfer the noise straight past the underlay. For underlay the classic approach would be to use cork tiles, however these have fallen out of favour for decoration and therefore are getting harder to find. Also for the size of layout they would have become fairly expensive and time consuming. There is off the shelf model railway underlay available, however this is even more expensive! The option I went with followed some suggestions from people around closed cell foam. On looking around I discovered that B&Q had a range of laminate floor underlay that is 3mm think grey foam. This seems ideal as for £25 I get more foam than I can ever want, it’s not too thick, easy to work with and perfectly coloured to go under the track with ballast on top. For fixing the track I didn’t want to go down the track pins route. The offical track pins are so thin as to be hard work to use. I could go with small tacks, but even these are fiddly and would potentially transmit noise to the base board. Again after reading around I eventually went with Copydex glue as the solution. I’m using this for both the foam to the baseboard and also the track to the foam. This turns out to be very quick to lay on the straights, however for the corners I’ve had to use notice board style pins to hold the track in place while the glue drys. Here are a few photos of the track laying in progress. 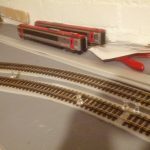 I’ve started with the simple sections, but rapidly am heading round to have to start working on some of the more complicated junctions or fiddle yard. 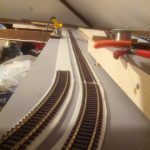 After this comes the start of the wiring challenge…..
Where the laying started with the track disappearing off in the distance…. This entry was posted in Model Railway and tagged 2016, Model Railway, Track laying by John. Bookmark the permalink.